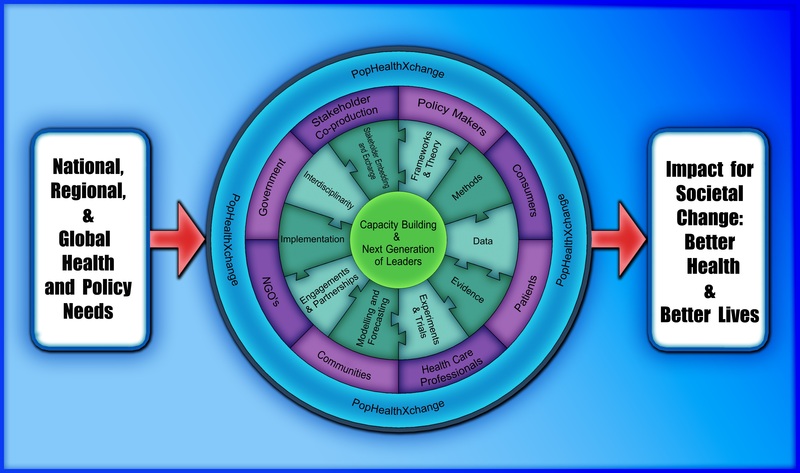 The Population Health Exchange (PHXchange) provides resources for fostering partnership and knowledge co-production among researchers and diverse stakeholders in order to achieve better health outcomes through evidence-informed policy and practice change. We connect population health to social, environmental, political and economic drivers to provide better understanding of, and inform implementation of effective action on, entrenched and emerging health problems in Australia, the Asia-Pacific region, and globally. We respond to critical community health needs by building effective partnerships with governments and business, as well as the professional sector and non-governmental organisations. Our mission is encapsulated in the figure above. We are building a resources repository, which will become available on this website as sections are developed. We have an active partnership with the Integration and Implementation Insights blog. You can see blog posts contributed by PHXchange members. PHXchange resources are developed using the multidisciplinary strengths of members across the Australian National University’s Research School of Population Health. Concepts and methods for knowledge co-production, research impact and more. Quick, easy-to-read introductions to methods and concepts for research implementation, stakeholder engagement, collaboration and more. You are welcome to attend PHXchange events.